Our founder Todd Brown created the 180 Medical Scholarship Program as a way to help students living with medical conditions like Spina Bifida, spinal cord injuries, and more. We offer this award each year to 7 deserving students to assist them with their career goals through higher education. Last August, we proudly announced the 7 recipients of the 2018 180 Medical College Scholarship. Since then, we’ve been featuring each inspiring scholarship recipient on our blog. Check out the other students featured so far, including Kale, Marissa, and Alaina. 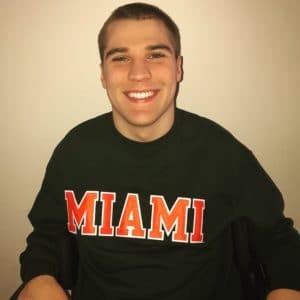 Now, we’re excited to introduce our readers to Ian, a young man who demonstrated great determination and courage after a spinal cord injury left him a quadriplegic. By all accounts, Ian had everything going for him as he entered high school. He was a Division 1 wrestling and football recruit. He served his community by mentoring and coaching a local wrestling club, organizing a 5K race to benefit local firemen, and eagerly taking volunteer opportunities. 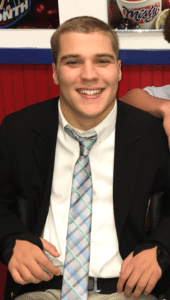 In addition to his athletic achievements in football and wrestling, he also maintained high grades while staying active in his high school’s Key Club, campus ministry, and yearbook. Then in the summer of 2016, the unthinkable happened. As he wrestled in a match during the World Team Trials, he landed on his head. Instantly, he was paralyzed from the neck down. 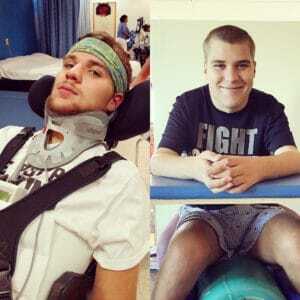 He was rushed to the hospital where he spent 2 months in intensive care as a new C-4 quadriplegic. He even needed assistance to help him breathe with a diaphragmatic pacer due to the severity of his spinal cord injury. During the many months of rehab and bed rest that followed, Ian had to relearn life from a new perspective in his motorized wheelchair. “Since my injury, it’s a very different picture,” says Ian. He had to go from an active, independent lifestyle to depending on others, like the nurse who assists him during the day. Still, he had to make a decision. It would have been easy to mourn everything he lost when he was injured on the wrestling mat. However, Ian wasn’t ready to give up on his life or his dreams. “I cannot dwell on what I have lost or what I used to be, because that’s not healthy, and that is not the way I work,” says Ian. Ian feels his track record of working hard and staying disciplined as an athlete has been a huge help. He makes sure to go to physical and occupational therapy for 4 hours a day after school, and since his injury, he has regained some core strength and the use of his arms. During his senior year, his class unanimously elected him their Class President. On top of that, he decided to create a chess club at his school. He continued to work hard at keeping his grades up and became president of his school’s Students Against Destructive Decisions Club. Ian’s original career goal has not changed, thanks in part to two physiatrists who encouraged him to keep pursuing his dream, despite his spinal cord injury. I’ve always wanted to be able to help people, and medicine was always my goal. Now I’m hoping to help others just like me. Last fall, Ian made the first move toward his goal of becoming a doctor. He enrolled in a Neuroscience program at the University of Miami. This big move takes him a long way from his hometown, but Ian stays determined to keep his eye on the future. We’re all rooting for you, Ian! We’re now accepting applications for our 2019 180 Medical College Scholarship Program! You can get the full scoop on eligibility requirements and download a scholarship application at www.180medical.com/scholarships. Meet one of our nine amazing scholarship winners, Ian, as we tell a little more about his story and the goals he plans to achieve in graduate school.